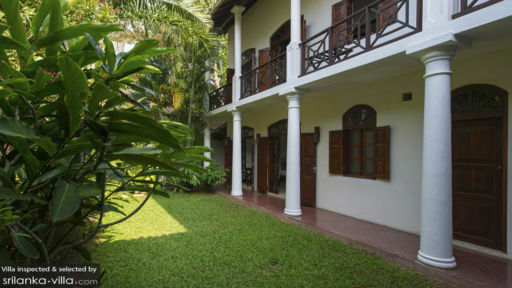 A Dutch-inspired home in the heart of the UNESCO World Heritage Site – Galle Fort in the city of Galle, Galle Fort 39 is a unique concept villa where guests can relive some of the history of Sri Lanka. Where each corridor and each room breathes a bit of the past, the villa is a two-storey home with a shingled roof and white washed façade. Surrounding the villa are lush green gardens that are grown with abundant tropical flora and the walls that afford utmost privacy to the guests. Where you can view the top of the fort from one room, the other provides a breathtaking view of Lighthouse Street. For an enriching as well as comfortable holiday, Galle Fort 39 would be your ideal choice. 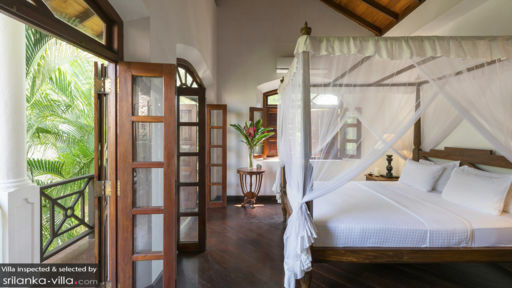 There are three bedrooms at Galle Fort 39, each a lesson in history with customised antique furniture including two, four-poster queen-sized beds draped in white mosquito nets, and one simple queen-sized bed, cabinets, coffee corners with armchairs, etc. 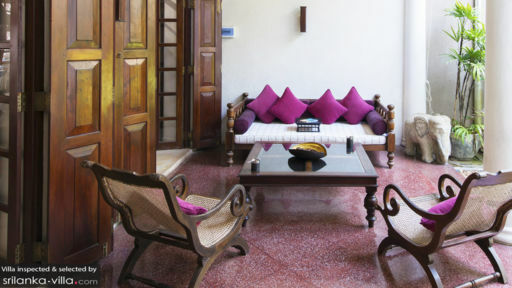 Two bedrooms lead to the terrace with views of the top of the Galle Fort and Lighthouse Street, respectively, and the third leads to the courtyard and terrace. The bedrooms come with en-suite bathrooms that are fitted with modern amenities including walk-in showers. Well-kept manicured gardens await behind the walls of Galle Fort 39 with bounteous nature emitting fragrant aromas that will leave you heady and rejuvenated. The refreshing ambiance is a delightful break for the senses where guests have the chance to relish the serenity of the surrounding areas. The terrace in the gardens in furnished with a lounge comprising comfortable seating including antique sofas and chaises. Upstairs, you can relax on the outdoor chairs and enjoy the view of the city streets come alive with its history. Right from the terrace, one enters the spacious and vintage living area that is designed in an open-plan layout with large, arched doorways leading outdoors. Featuring framed wall tapestries, hanging lights, floor lamps, antique sofas and wooden chairs, as well as hints of royal red tones, the living room is an entirely different world. You will find living here at Galle Fort 39 truly a unique experience with its old-world, understated beauty and historical charm. Another living room serves as the media room with plush seating and modern amenities such as a flat-screen TV. A long, 10-seater dining table is found right at the entrance of the living room with sweeping views of the gardens. The spacious room is owing to its high-pitched ceiling with exposed wooden beams and arches. A stairwell leads to the upper floor and right at the foot is the entrance to the kitchen that is fully-equipped. The villa offers personal guest assistance to its guests to ensure that all needs and demands are accounted for. There are special services on offer including babysitters, airport transfer, personal chef, and laundry that are available at an extra cost. While at Galle Fort 39, you are at the most beautiful location nestled inside the historical Fort that was built over 400 years ago. The Dutch-era architecture is still very much prevalent in Galle, which is another lively location with plenty of shops, local restaurants, and things just waiting to be discovered. Head to the beach to catch the sunset and stilt fishermen going about their daily activities. We stayed 5 nights in Galle Fort and enjoyed every minute. The house has an open concept living/dining room that looks on to the enclosed back garden. All of the bedrooms were air conditioned and quiet, perfect for sleeping. It was great to stay so centrally in the fort and have easy access to so many restaurants and sights. We were able to go back and forth as we wished, for rest breaks from the heat outside. We travelled with 2 children, an infant and a 4 year old and were battling jet lag. The staff were very good with the kids and we could get out to dinner on our own sometimes if the kids needed to sleep. And yes...the Wifi works well! You get some power cuts and other interruptions but it was good enough that we could even do some work as needed. The location is fabulous. You can walk to the bars, restaurants, beach and ramparts. The staff is obliging and un-intrusive. The place is tastefully put together to offer the visitor modern comforts with a touch of Sri Lankan charm. Wonderful villa in Lighthouse street - beautifully appointed for relaxation with friends or family. Totally wonderful location to explore Galle's restaurants and shops and opposite the best lounge bar in town. Loved it and will definitely go there again!